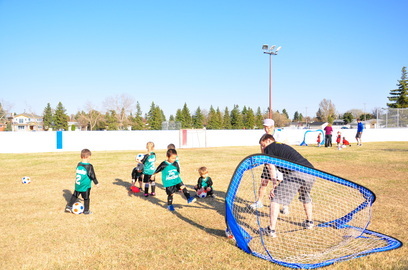 ﻿Greenfield Community League runs an outdoor recreational soccer program for kids aged 4 to 18 as part of Edmonton Minor Soccer Association South West (SWEMSA). The regular season runs from first week of May until the end of June, with post season play into July. Most players have two games and one practice per week. For more information, please contact our Soccer Director (Tara Wren) via email. Greenfield Community League will be accepting soccer registrations for residents of Royal Gardens and Aspen Gardens. 2019 Outdoor Soccer Registration will take place from January 15 to February 28, 2019 ON-LINE via the emsa portal and will be available after Feb 28 depending on the spots available on teams. All players must indicate the community in which they live, and pay their community’s soccer fees. Transfer requests to another community can be indicated on the registration form and will be accommodated whenever possible. Payments and deposits for uniform and volunteer commitment will be accepted at the SWEMSA office at #211, 11 Fairway Drive or by attending a Southgate District payment session (communities of Aspen Gardens, Duggan, Empire Park, Greenfield, and Royal Gardens). You may attend any session if you reside in any of these communities. NOTE: Please complete applications for funding PRIOR to attending a Southgate district payment session. Payments should be made as soon as possible and a $50 late fee will apply if received after February 28. Late registrations will be placed on a wait list and considered only if there is room on the desired team. Fees will only be collected if your child is placed on a team, however registration is not considered completed until the online application is completed, cheques are received and paperwork is verified. If your child is trying out for the Southwest Sting FC and is offered a spot on a team, your Community soccer cheques will be destroyed and you will be required to issue payment directly to the club soccer program. In this case, the Volunteer and Uniform Deposit cheques written to your community will also be shredded. Please note: cheques will be destroyed once the uniform is returned (uniform return deadline July 15, 2019) and the volunteer job is completed. ​Cheques will not be returned. A $50 LATE Fee will apply after February 28, 2019. A $20 NSF fee will be applied to all returned cheques. If you are in need of financial assistance for your child to participate in organized soccer, there is help available through Canadian Tire's Jumpstart program and Kidsport Canada. Please visit their webpages for more information.